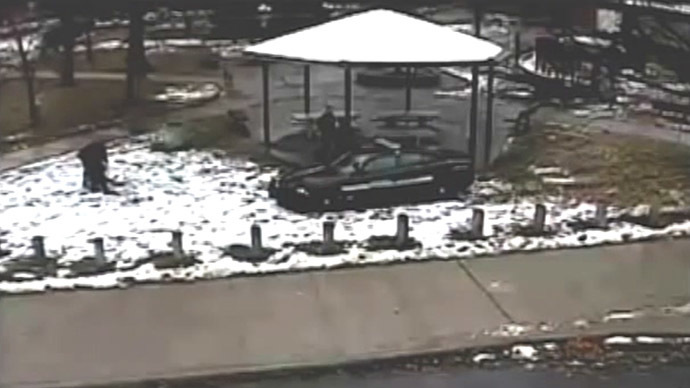 Police tackled and restrained the teenage sister of 12-year-old Tamir Rice when she rushed to her dying brother after a Cleveland, Ohio cop fatally shot the boy in November, according to newly released video footage of the now notorious incident. The Cleveland Police Department shared the 30-minute recording on Wednesday night, lending credence to claims made by the Rice family about how law enforcement acted in the immediate aftermath of the shooting. This comes in the midst of a wave of similar tragic officer-involved incidents that have unfolded across the United States in recent months. "This has to be the cruelest thing I've ever seen," Akron-based attorney Walter Madison, a representative of the Rice family, told the Northeast Ohio Media Group when he viewed the video footage. On November 22, 2014, the Cleveland Police Department received reports concerning a male with a gun at an area playground, and a cruiser, with Officers Timothy Loehmann and Frank Garmback, arrived on the scene shortly after. Police said Loehmann engaged when Rice reached into his waistband, and that officers didn’t learn until after the fact that the boy only had a non-lethal airsoft pistol. An abbreviated, 2.5-minute video clip, taken from a nearby surveillance camera and released by the police days after the incident, showed previously that Loehmann, 26, fired two shots at Rice in just as many seconds. This happened as soon as the officer got out of his vehicle, fatally wounding the boy. According to the new footage made available this week, roughly one minute after Rice was shot by Officer Timothy Loehmann, the victim’s 14-year-old sister sped to his aid but was intercepted by another cop, forced to the ground and eventually detained in a nearby patrol car only a few feet from her dying brother. Cory Shafer, a reporter for the Northeast Ohio Media Group, wrote on Wednesday that the video, released only after a lengthy debate between the press group and city officials intent on withholding the footage, confirm claims made last month by Samaria Rice, the mother of the deceased. "I noticed my son laying down on the ground and I went charging and yelling and everything at the police because they wouldn't let me through," she said during a December 8 press conference. "Then I seen my daughter in the back of the police car -- the same car that the shooter got out of. As I was trying to get through to my son, the police told me to calm down or they would put me in the back of a police car." "She told me that the police tackled her and put her in handcuffs,” she recalled hearing from her daughter. “I didn't even know she was in handcuffs. I knew she was crying for me, but I couldn't see her hands. This is what she told me that she was in handcuffs in the back of the car. They also questioned her with no adult around." The Rice family filed a lawsuit last month against the city of Cleveland and the two officers, and Mayor Frank Jackson said last week that Cuyahoga County Sheriff's Department had taken the lead in the local investigation. The second-in-command at that office will spearhead the probe, Shafer reported, and then hand evidence to Cuyahoga County Prosecutor Timothy McGinty, who is tasked with presenting the information to a grand jury responsible for deciding whether or not any of the officers should be criminally indicted. “We found that CDP officers too often use unnecessary and unreasonable force in violation of the Constitution. Supervisors tolerate this behavior and, in some cases, endorse it,” the department’s report concluded. “The DOJ and the city of Cleveland have come together to set in motion a process that will remedy these issues,” Holder said. Tamir Rice’s death came only two days after a grand jury in St. Louis County decided not to indict Darren Wilson, at the time an officer with the Ferguson, Missouri Police Department, over an August 2014 incident in which he fatally shot Michael Brown, an unarmed black teen. Coupled with similar tragic events, including the death in July of Eric Garner in Staten Island at the hands of the New York Police Department, rallies and protests have raged across the US in an effort to raise awareness of what demonstrators say are unjust law enforcement policies and police tactics.